ATTACH YOUR F100 ACTION CAMERA FOR BIRD’S-EYE BRILLIANCE: The F100GP is designed with weight and balance in mind to optimize in-flight GoPro photo and video capture. 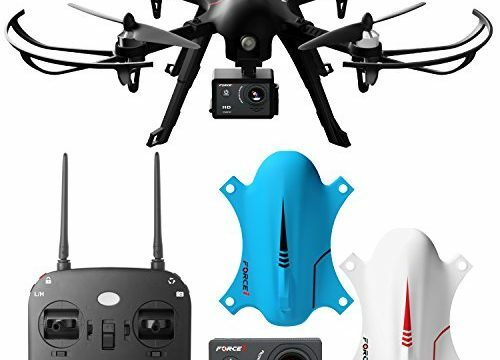 ENJOY AMAZING VIDEO/PHOTOS WITH BRUSHLESS MOTOR TECH: Take advantage of smooth, ultra-quiet flight that’s perfect for capturing video and imagery with less vibration and audio distortion, and have fun going into “stealth mode” to sneak up on family and friends! EASY CONTROLS + HIGH/LOW SPEED MODE: Make crashes a thing of the past with easy-to-learn controls that includes a High/Low speed mode for super-smooth response – a must-have feature for beginners, and a luxury for pros. EXTRA-LONG FLIGHT TIME + BONUS BATTERY: Master the basics and so much more with up to 15 minutes of flight per launch. Plus, we’ve added an extra battery to double your flight time! CRAZY STUNTS: Impress your friends with slick tricks and 360° flips that will make their heads spin – and then capture their smiles on video with a surprise flyby!